The firm said revenue for 2018 hit 721.2bn yuan ($107bn), while net profit jumped 25% to 59.3bn yuan. The US and others have restricted the company over concerns that its ties to Beijing represent a security threat. Huawei says it is independent and strongly denies its products pose a security risk. The Shenzhen-based firm said global revenue surged 19.5% in 2018, its fastest pace of growth in two years. The result was supported by strong sales of smartphones in China. At the same time its carrier business, which sells telecoms infrastructure to countries around the world, eased 1.3%. Huawei is the world's largest maker of telecoms equipment. It faces a growing backlash from Western countries on concerns over the security of its products used in next-generation 5G mobile networks. 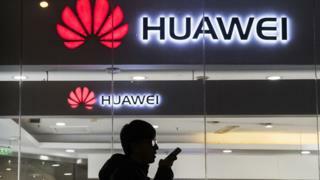 Several European telecoms operators are considering removing Huawei equipment from their networks, and a report by UK cyber authorities out this week strongly criticised the tech firm. The report, issued by the National Cyber Security Centre, said it can provide "only limited assurance that the long-term security risks can be managed in the Huawei equipment currently deployed in the UK". Huawei has begun pushing back. It has launched a more aggressive strategy in recent months to counter what it sees as an American "smear" campaign. Earlier this month, it filed a lawsuit against the US government over a ban that restricts federal agencies from using its products, arguing it is "unconstitutional."